Implantable contact lenses (ICLs), also known as phakic IOLs, offer an exciting alternative for those under 45 years of age who suffer from moderate to severe myopia and are not candidates for laser vision correction. These lenses are placed inside the eye where they work in combination with the natural lens. The procedure usually takes less than 20 minutes and can provide excellent quality of vision. I hope this review of our selection parameters will help in your patient education and counseling. LASIK and PRK are limited in their ability to treat high degrees of myopia. Removing too much tissue from the central cornea can lead to corneal destabilization (ectasia) resulting in fluctuating refraction and decreased vision. Attempting too much correction can also induce dry eye and lead to photopsia. 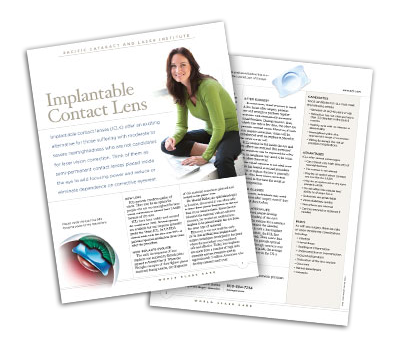 In our experience with more than 70,000 refractive surgery cases, implantable contact lenses are often an excellent alternative when laser vision correction is contraindicated. Two options are currently available in the USA—one is iris fixated in the anterior chamber and the other is positioned in the posterior chamber. The implant our surgeons currently prefer is the posterior chamber Visian ICL by STAAR Surgical. The Visian ICL is available to correct myopia between -3 and -20 diopters. The pupil is dilated and a small, sutureless cataract-surgery-type incision is made. The folded ICL is carefully injected and tucked into place behind the iris. To ensure adequate fluid flow, our surgeons typically perform a YAG laser iridotomy 1 to 2 weeks prior. Immediate post-op care is done at PCLI, including IOP check 4 hours after the procedure. Visual outcomes of patients treated at PCLI have been excellent—due in part to careful selection. Risk factors include glaucoma, pupillary block, corneal endothelial cell loss, cataract formation, elevated IOP, as well as iris and angle abnormalities. Risks are also associated with irodotomy including elevated IOP, hyphema, iritis, glare and halos. The good news is that several studies of the current ICLs show very few incidents of endothelial cell loss, cataract formation and elevated IOP. Patients should have a refraction that has not changed more than .5 diopters in the past 6 months. A cycloplegic refraction is required. 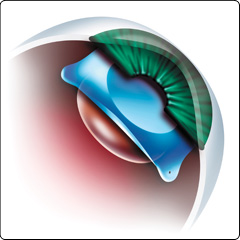 Prior to the procedure, contact lenses should be left out long enough for stable topography to be documented. With spherical soft lenses, this might take 3 to 7 days or more. 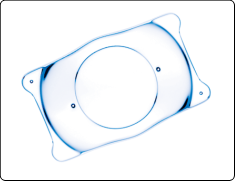 Toric soft or rigid gas permeable lenses may require 2 weeks or more. Patients with more than 2.5 diopters of astigmatism are not good candidates—unless laser vision correction of astigmatism is planned relatively soon after the ICL procedure. Depth needs to be at least 3mm as measured from the central corneal endothelial surface to the iris. We typically use the Pentacam or IOL Master for this measurement. 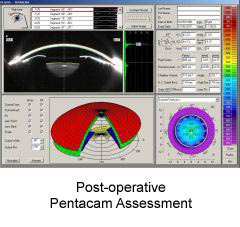 Because the IOL Master includes corneal thickness, this measurement must be subtracted from the total. Minimum endothelial cell density varies according to patients’ age and AC depth. The range is typically from 3875 cells/mm2 for 21-25 year-olds with 3mm chamber depths to 1900 cells/mm2 for 45-50 year-olds with 3.5mm chamber depths. The final determination is at the discretion of the surgeon. Because adequate size of the ICL is critical to a successful result, the white to white measurement must be between 11.5 and 13mm. We use slit lamp and calipers in the clinic as well as our IOL Master. In addition, these measurements are verified by the surgeon with the surgical microscope prior to ICL implantation. When we receive your referral, we review your exam findings and refractive data. Then we perform the following tests and measurements—topography, pupil size, careful gonioscopy, intraocular pressure, white to white measurement, anterior chamber depth and endothelial cell count. A dilated exam is done to inspect the lens and retina. Risks, benefits and alternatives are reviewed with qualified candidates, as well as the need for an iridotomy. We also reinforce the importance of follow-up care with the family eye doctor. These exams should include visual acuity, refraction, topography and keratometry, IOP, and biomicroscopy—with careful assessment of the anterior chamber, ICL position and vaulting as well as the natural lens. Visian toric ICLs are available in Europe and Canada and FDA trials of these implants with 1 to 4 diopters of cylinder correction are underway. They are expected to become available some time this year. The AcrySof phakic angle-supported ICL is also under FDA investigation. This lens offers -6 to -16.5 diopters of correction. With the popularity of laser vision correction, ICLs are low on the preference list of many refractive surgeons. However, we have found them to provide excellent vision for qualified patients. Accommodation is preserved, the procedure is reversible, corneal healing is not a factor in the outcome, and post-op dry eye is not an issue. If need be, ICLs can also be combined with laser vision correction. Please contact us with any questions. Click to order copies of our new ICL patient education brochure—or call our Professional Relations department at 800-888-9903.